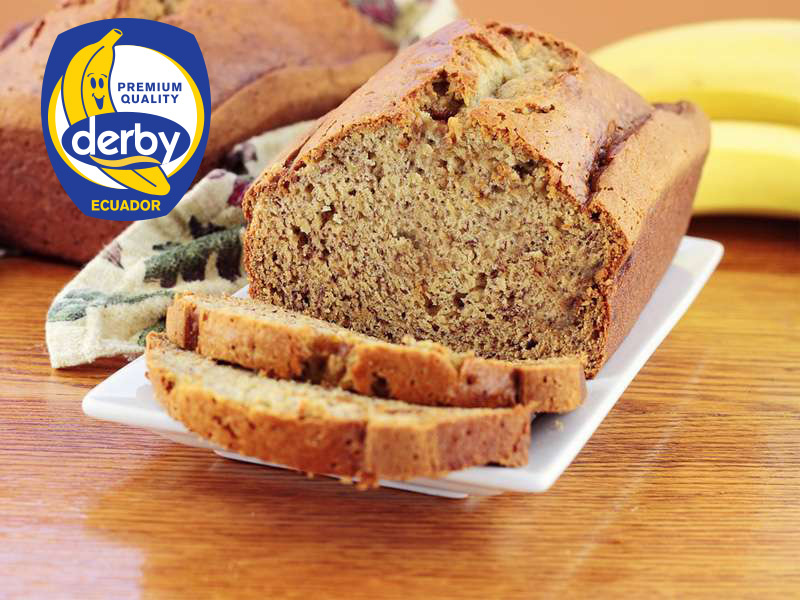 Bread with bananas | DERBY® PREMIUM BANANAS RASTODER Company - DERBY bananas and other fresh FRUIT and VEGETABLED for you! Banana bread is popular in Asia and America, but you can simply do it at home. The recipe is so simple that the chefs beginners can also make preparations. The preparation of this bread lasts only 15 minutes, and the baking is only one hour. The basic rule in the preparation is mixing “dry with dry, wet with wet”. Bananas with fork, mix one egg and 50 g of softened margarine, mix with flour, sugar, baking soda and salt. Pour the mixture into a greased baking dish and place it in the oven, heated to 170 degrees, and bake for about 45 minutes. Using the toothpick method, make sure that the bread is really baked: the bread is not baked if the toothpick stuck in the bread is not dry when you pull it out. Put the bread out of the baking tray and cool down before serving. The bread should be wrapped in a rag, so it can remain fresh in the open for several days, and the best one is after two or three days.